"One of the major unresolved and perhaps unresolvable difficulties with the Amarna Period is how to disentangle whatever hostility there might have been to Akhenaten's religious ideas with the dynastic politics of the day. The end of the Amarna Period witnessed the demise of a long established ruling family that was rooted in an even longer Theban ascendancy. It was the end of an era and the start of a new one. The advancement of those who took over might have dictated the agenda of court affairs just as much as dislike of Akhenaten's ideas. The fate of Nefertiti's mummy, even if we know what it was, is not likely to help us here." See the above page for the entire interview. "How did Freud afford his habit? His favourite antiquities dealer in Vienna was Robert Lustig, a personable young man who specialised in Egyptian, Greek and Roman artefacts. When Freud first met Lustig, he explained: 'I am not a rich man. We can trade.' Visiting Freud's rooms, Lustig's eyes nearly popped out of his head. He had never seen so many antiquities in a private home. Between 1927 and 1938, Freud bought about 200 works from Lustig, including Isis Suckling the Infant Horus, an Egyptian bronze from around 664BC, that he gave a prominent place on his desk. The story of how Lustig acquired Isis indicates how undervalued antiquities were in Freud's lifetime. Lustig spotted the statue in a junk shop near Vienna. When he asked the price, the shop owner put the statue on the scale to weigh it, and Lustig bought it for the price of the metal." See the above page for the full story. Probably easier to read as a single page (click on the Single Page option, bottom right of the above page). Winning image of the mummy scan, mentioned last week, which won the photography category of the 2006 Science and Engineering Visualization Challenge. Truly fascinating. "Zahi Hawas, Secretary General of the Supreme Council of Antiquities (SCA), won Thursday the Oscar Emmy Award presented by the Academy of Television Arts and Sciences for the best TV film at the international level. Hawas won the Prize over commenting at the background of a documentary film on Pharaoh King Tutankhamen and the Valley of Kings and expounding the old Egyptian civilization. Also, the film's director won the same prize on the movie which was produced by the CBS channel in 2005. The award is a golden statue of a winged woman holding ball with Hawas's names written at the bottom. Hawas is the first Egyptian to win such a prize and it is the first time that the winner of such award was not working in the media domain." "The biggest annoyance in the game was the bugs. I was 8 hours into the game and I was playing one of the Mummy's stages, and I was suppose to walk past a Watching Eye and enter the door behind it. What confused me was there was 2 doors to walk through! There was one with one Watching Eye, and another with four Watching Eyes. I couldn't get past the one watching Eye since it had cages near it and I wasn't fast enough with the Invisible stone." Summary of a Radox-sponsored history of beauty: "Ruins from the Egyptian city of Tel-el-Amarna reveal an early form of shower, a series of aquaducts, to provide the rich with water for showering – although they would need a team of servants to pour the water over them." Scientists and researchers produced lots of theories in an attempt to learn the purpose of the pyramids. Some theories claimed the pyramids were used as a tomb for the rulers of ancient Egypt. Others maintained the gigantic structures were used as observatories or equipment for marking water levels during the flooding of the Nile. According to a number of other theories, the pyramids were built for landing alien spaceships, storing grain, and damping vibrations in the earth’s crust during earthquakes. Using the pyramids as waterworks is a novelty of sorts." See the above page for the full story, complete with Volgin's arguments in favour of his suggestions. This important item dates back to the 21st September, so thanks to Kat for finding it and bringing it to my attention: "When Douglas Brewer ventured deep into the Egyptian desert this year, he expected to find possibly 100 examples of 'rock art'—evidence of ancient civilization. What he actually found were well over 1,000 examples—a treasure trove of rock art. The desert art, which was pecked or sometimes incised into large rock faces, depicted elephants, ostriches, giraffes, and many hunting scenes. But perhaps strangest of all was the abundance of boats depicted in the art. After all, this area was far from any body of water, says Brewer, a University of Illinois professor of archaeology and director of the Spurlock Museum in Urbana. According to Brewer, this find may have raised more questions than it answered. . . . Brewer says the desert people of ancient Egypt lived in the shadow of the great culture that developed in the famed Nile Valley. . . . Even today many people do not believe a complex culture existed in the eastern desert of ancient Egypt. But evidence of rock art could shatter this image, especially if the art depicts domesticated animals and crops—as was the case with the rock art discovered by the Illinois team." Please see the above article for full details. On the Science Magazine's Random Samples page, there's a short paragraph about the Petrie Museum and its plans to move to new premises: "The Petrie Museum, one of the world's biggest collections of ancient Egyptian artifacts, has been "temporarily" housed at University College London (UCL) since 1953. But its 80,000 objects are finally going to have a permanent home. Groundbreaking began this month on a new building on UCL grounds, to open in 2010. The museum is named for Egyptologist William Flinders Petrie (1853-1942), whose excavations provided a wealth of objects from daily life such as pottery, lamps, and jewelry ranging from prehistoric times to the Islamic period. The $53 million project is good news to the archaeologists who now flock to the Petrie's cramped quarters to do research." The October/November issue of Archaeological Diggings is now available, featuring some Egytpological topics, including the transportation of Ramesses II to his new home in Cairo, an article about ancient Egyptian antiquities from the Louvre in Paris, and another on items accompanying the ancient Egyptian dead in their tombs. Their is also the regular News from Cairo feature. This is only available in print edition, and full subscription details are shown on the above site. "Egypt has agreed that Bahrain can host a roaming exhibition of Pharaoh Tutankhamun in April. Egyptian Ambassador Dr Azmi Khalifa said Bahrain will be the first Arab country in Middle East and North Africa to host this exhibition which mirrors the golden era of the pharaohs. The exhibition is currently in the US and will move to South Africa then to Bahrain and will stay here for six months. Dr Khalifa said that assistant under-secretary for culture and heritage Shaikha May bint Mohammed Al Khalifa will visit Egypt to be briefed on the conditions of hosting such an exhibition." This is the complete article on the Gulf Daily News website. Please see the following update and request for feedback re the excellent Abzu service, from Chuck Jones. Abzu is an excellent resource for Near Eastern (and Egyptian) documents, with authors like Sir William Flinders Petrie and Guy Brunton well represented. One year ago we implemented the RSS feed from Abzu, and later the What's New in Abzu blog http://www.bloglines.com/blog/AbzuNew with its own RSS feed. We did this to allow users to have better access to material newly entered into the Abzu database. You can still find material newly added to Abzu by following "View items recently added to ABZU" link at: http://www.etana.org/abzu/. Entries stay there for a month from the date they are entered. http://www.faganfinder.com/search/rss.shtml (among other places) for assistance in choosing an aggregator. this message wherever it may be useful. Sneaked in because it is a slow news day. This is an interesting article about John Hawksmoor, to tie in with the retoration of a Hawksmoor church in London (well worth a visit if you live in/visit London). Hawksmoor was considerably influenced by "pagan" symbols, including those of Ancient Egypt: "He was passionate about all forms of religious architecture, from ancient Egypt, to Greece and Rome, to Islamic mosques and the English Gothic tradition. The cube form of St George's Bloomsbury is an allusion to the temple of Solomon in Jerusalem - the original temple and the key work for freemasons. The obelisks and pyramids scattered through his work might indeed form some elaborate 'Hawksmoor code' revealing the location of the Holy Grail; or they could simply be architectural quotations from a tirelessly inventive artist." See the above article for the full story. The Challenge is intended to celebrate and encourage the visualization of research. First place in the photography category was a phtograph of the scan of a child mummy from the Rosicrucian Egyptian Museum: "An Egyptian Child Mummy (Credits: W. Paul Brown, Robert Cheng, Rebecca Fahrig, Stanford University; Christof Reinhart, Volume Graphics). For, 75 years, this child mummy resided in the Rosicrucian Egyptian Museum in San Jose, California, its body unseen by human eyes, its story a mystery. In 2005, a team of researchers and computer engineer Paul Brown of Stanford University began to unravel the threads of this mystery using the latest in imaging technology. Using a high-resolution scanner to generate 60,000 2D scans of the unwrapped mummy and applying addition 3D computer graphics created a 3d model of the mummy and its interior. Analysis of the data revealed that the 2,000-yer-old mummy is the remains of a 4-to-5 year old girl who, researchers concluded, likely died unexpectedly from an infectious disease." Thanks to Aayko Eyma's post to EEF for the information that the first issue (Spring 2006), of 'Damqatum' the newsletter of the Centro de Estudiosde Historia del Antiguo Oriente (CEHAO), Departamento de Historia, Facultad de Filosofía y Letras, Universidad Católica Argentina, has appeared, edited by Juan Manuel Tebes (jmtebes@yahoo.com). The first issue of the newsletter is available free of charge from the secon address, above, in PDF format. The department's area of interest is the "ancient orient" so it deals with many regions. This first issue has items about Ramat Rachel (Israel), the Hans Goedicke Foundation, a News section which includes reviews of the Hatshepsut and Tutankhamun exhibitions, and a CEHAO News section announcing new courses, conferences etc. The newsletter is in English. Contact details and other relevant website addresses can be found on the above pages. The organising committee of Current Research in Egyptology (CRE) VIII have announced that CRE VIII will take place at the University of Wales in Swansea between Thursday 19th - Saturday 21st April 2007. Papers are invited from students involved in graduate research on ancient Egypt and Nubia ranging from the Predynastic to the Coptic Periods. Contributions are also invited from anyone who is involved in research associated with Egyptology, from any background or training. Further information regarding the conference can be found at the above website. "Even if you can't see mummies on display, area institutions are offering plenty of fascinating activities, events and exhibits related to ancient Egypt. From an exhibit at the Flint Institute of Arts on the excavations of the world's first archaeologist to films, music, planetarium and family programs, the public will get a bird's eye view of Egypt. The events are organized by the FIA, the American Arab Heritage Council and a host of other organizations. You can experience a chariot ride, courtesy of Kettering University students' engineering skills, and help construct a 6-foot mummy at the Children's Museum of Flint." See the above pages for the full list. "Before Sir William Flinders Petrie entered the scene, there were a lot of treasure hunters but no archaeologists. In a way, Petrie was the prototype for Indiana Jones - the first archaeologist 'anywhere in the world,' according to Peter Lacovara, curator of ancient art at Emory University's Michael C. Carlos Museum in Atlanta. In the 1880s, when he was in his late 20s, Petrie decided to go to Egypt and measure the Great Pyramid at Giza. " See the above three page story for more. "An Egyptian archaeological expedition has discovered Greek-language engravings in Alexandria, Egypt's Minister of Culture Farouq Hosni announced on Tuesday. The engravings, which were discovered close to the Amoud al-Sawari monument, are said to date back to the times of Roman Emperor Marcus Aurelius (ruled 161-180 AD. )The secretary general of the Supreme Council of Antiquities, Zahi Hawwas, said the engravings are six lines long and were found etched on an artefact measuring 50 centimetres long and 36 centimetres wide, which may perhaps be part of an ancient altar.The engravings are said to be writings glorifying the supreme ancient Greek deity Zeus along with several other Greek gods." See the above page for the remainder of this article. "While carrying out a survey on the archaeological valleys and hills on Luxor's West Bank, in an attempt to locate sites used by the Copts, an archaeological mission of the French Institute for Oriental Studies has unearthed a significant number of clay sherds dating back to the Coptic era (451 - 641 AD). . . . In Haggag Valley Aspaniya, the team succeeded in locating six Coptic archaeological sites, one of which includes a cave with bent corridors covered with gypsum and bearing Coptic inscriptions." Not news, but thanks to Glen Fricker for sending the link to this superbly detailed satellite photograph of the Giza Plateau. "Alumnos e investigadores de las tres Universidades SEK en Chile, Ecuador y España participarán en la excavación, de uno de los complejos funerarios egipcios más grandes del oeste de Tebas, la tumba del cuarto profeta de Amón y Gobernador del Alto Egipto, Monthemhat (670-648 a.c) . . . . En concreto, el proyecto consiste en el registro, restauración y documentación de la tumba número 34 del alcalde de Tebas, cuarto profeta de Amón y gobernador del Alto Egipto, desde Hermópolis en el norte hasta Elefantina en el sur, Monthemhat, quien vivió, aproximadamente, entre el 670 y el 648 a.c, pudiendo datarse su tumba de aquella época. Con sus 57 cámaras y dos patios, la tumba de Monthemhat es un impresionante complejo funerario que aún no ha sido investigado a fondo ni excavado en su totalidad." Work begins in December 2006 and is expected to run to January 2007. The project will include restoration and detailed documentation. "Spanish Egyptologists were in La Laguna last week to attend a congress hosted by the university, one of the few in Spain which boasts a department of Egyptology. And it was the university’s plain-speaking professor of archaeology, Antonio Tejera Gaspar who grabbed the headlines when he took the opportunity to once again call into question the origins of the pyramids at Güímar.And though he discounted any direct linkage between the aboriginal inhabitants of the Canary Islands and the ancient Egyptians, a theory based on their love of mummifying their dead and which has gained ground in recent years, the professor admitted that an indirect relationship was possible. . . . The Congress was attended by some 120 Spanish Egyptologists and Egyptologists from Spanish-speaking countries." - Final announcement with complete programme and participants list: February 2008. "In an interview yesterday with the eTurbo News, Dr. Hawass gave an update on the KV-63’s very latest. He said, 'Still there are 16 sealed pottery vessels, which have not yet been analyzed. The expedition team only returns in January next year to open these vessels. In the other vessels which have been opened, there is written the date year 'that bears no name of the king. Hopefully, the closed vessels will contain his name.Hawass thinks the jars (that reach a few inches above my knees, perhaps 2 feet high) probably contain natron and certain seals similar to the other 12 jars already opened. He believes the embalming cache represents a workshop or wabt for mummification that stood by the entrance of the Valley of the Kings." See the above page for more details about the current status of KV63 and excavations in Bahariya. A personal account, by Zahi Hawass, of the outgoing German ambassador to Egypt, Martin Kobler, and his role mediating between the German and Egyptian authorities over heritage issues: "Kobler came to Egypt as ambassador at about the same time as I became the secretary-general of the Supreme Council of Antiquities (SCA), and we met on many occasions. The first time was in the apartment in Zamalek where he stayed before he moved to the residence attached to the German Embassy. At that time, I was fighting for the return of the famous bust of Nefertiti, which was smuggled illegally out of Egypt in 1912 and is now in the Berlin Museum. Ambassador Kobler never criticised or disagreed with me; on the contrary, he made it clear that he understood my position and sympathised with my desire to have the bust returned. At the same time, he did state that the bust was the centerpiece of the collection at the Berlin Museum, and that it would be difficult, if not impossible, for the museum to agree to let it leave Germany." "Among the most important objects on show in Turin is the Turin King List, also known as the Turin Royal Canon. This unique papyrus is written in heretic, and owes its modern name to its being exhibited in the Egyptian Museum at Turin. The papyrus has broken into more than 160 very small fragments, many of which have been lost. When it was discovered in the Theban necropolis by the Italian traveller Bernardino Drovetti in 1822 it was largely intact, but by the time it had been added to the collection in the Turin museum, its condition had severely deteriorated. The importance of this papyrus was first recognised by the French Egyptologist Jean-François Champollion. The papyrus, now estimated at 1.7m long and 0.41m high, was written during the long reign of Ramses II and comprises on the recto an unknown number of pages that carry a list of names of persons and institutions, along with what appears to be the tax-assessment of each. It is, however, the verso of the papyrus that has attracted the most attention, as it contains a list of gods, demi-gods, spirits, mythical and human kings who ruled Egypt from the beginning of time presumably until the composition of this valuable document." A closer look at the project to add images of the Turin Egyptian Museum's Egyptology collection to the Eternal Egypt website: "The archaeological website Eternal Egypt, which displays Egypt's 7,000 years of history, was launched two years ago to make virtual access to Egypt from across the globe possible. It displays objects from collections in various Egyptian museums -- including the Egyptian, Graeco-Roman, Coptic and Islamic Art museums -- and will grant visitors information on every era of Egyptian history. Eternal Egypt combines the most important locations, artefacts, people and stories from Egypt's history into an interactive multimedia experience. . . . In this new section the museum in Turin will pay for its contribution and will provide all the information and data needed for each selected object, while CULTNAT will provide a team of experts to post the selections on the web." "Prime Minister Ahmed Nazif approved Tuesday19/9/2006 holding two exhibitions in Washington, D.C., and Los Angeles, the United States, to display Coptic artifacts of Saint Catherine Monastery. Culture Minister Farouk Hosni said the first exhibition, which will be held in Los Angeles under the title Icons from Sinai...Sacred Pictures from the Holy Land, will run from October 1 to March 4. He said the second fair, which will be held in Washington, D.C., under the same title, will run from November 1 to April 4. Dr Zahi Hawwas, Secretary General of the Supreme Council for Antiquities, said that artifacts include a mosaic of Virgin Marry while carrying baby Jesus Christ, a silver candlestick, a bronze cross in addition to rare manuscripts. Dr Wafa el-Sidiq, director of the Egyptian Museum, said that insurance premiums for the two exhibitions stood at US$410 million and US$22 million respectively. " This is the complete entry on the State Information Service website. Continuing its travels, Quest goes to Portland: "The Portland Art Museum is selling general admission tickets for its next blockbuster exhibit, an unprecedented look into ancient Egypt. The show evokes the ornately conceived afterworld of ancient Egyptians through 107 objects, including sculpture, jewelry, sarcophagi and other masterpieces of funerary art. The centerpiece of the exhibition is a full-size replica of the tomb of Thutmose III, the ruler of Egypt in the 15th century BCE." The exhibition will be running from 5th November 2006 to 4th March 2007. Thanks to Jerzy Prus for letting me know that the first issue of a new journal, The Polish Egyptoloical Journal (Polski Przegląd Egiptologiczny), in Polish and English, is now available. Details, including a Contents listing, with abstracts, are available at the above address, but note that the links to free of charge additional content on the site (indicated by three blue arrows) are only available in Polish. The Journal is introduced on the above page as follows: "The new journal will be published only in electronic version. Contents and abstracts of each issue will be published on the website http://www.egyptnj.com/ . To inquire about subscription write to prus@mindspring.com. The cost of one issue is $15.00 . Please note, that to each issue will be added a classical egyptological book in electronic version. Together with “PEJ” No. 1, comes a CD version of the famous book - GAUTHIER Henri, La grande inscription dédicatoire d’Abydos, Le Caire 1912, pp.V, 148." "The number of people visiting Egypt fell 5.5 percent year-on-year in July, according to figures available on Monday, the third consecutive monthly drop since April bombings in a Red Sea resort. The figures released by Egypt's Central Agency for Public Mobilization and Statistics (CAPMAS) show the number of tourists visiting Egypt fell to 794,000 in July, down from 840,000 in July 2005." See the above page for the remainder of this brief report. The University of Pennsylvania Museum of Archaeology and Anthropology has announced a new exhibition, running from November 12, 2006 - October 2007 entitled Amarna, Ancient Egypt's Place in the Sun: "Tutankhamun, ancient Egypt's most famous pharaoh (ca. 1332 to 1322 BCE), grew up in the royal court at Akhetaten (modern Tell el-Amarna). This royal city, located in a previously uninhabited stretch of desert, existed only a short time. It hardly survived the death of its founder, Akhenaten, Tutankhamun’s probable father, who introduced the belief in a single deity, the disk of the sun, called the Aten. The Egyptians abandoned both the new religion and the new city, and Tutankhamun led his people back to the traditional beliefs.The University of Pennsylvania Museum has a considerable collection of artifacts from this significant period, including many from 1920s excavations of Amarna. Now it has formed a special exhibition with more than 100 artifacts." See the above pages for more information (the second address has a full description). "Two international consortiums are now waiting for the final answer as to who will be responsible for the management of the construction and operation of the new Grand Egyptian Museum (GEM). The museum administration reviewed the presentations of the two companies on Wednesday and will announce the winner soon. According to a museum official, the project manager should be on board by the end of this year." "Details of the life and death of an ancient Egyptian woman began to emerge yesterday after her mummified body was scanned at a Tyneside hospital. Experts from the Hancock Museum in the city are examining the first of 800 images of the 3,000-year-old mummy Bakt Hor Nekht. The mummy was bought in Egypt in 1820 by Thomas Coates from Haydon Bridge, in Northumberland, who gave her to the Literary and Philosophical Society in Newcastle. The mummy, inside her linen and plaster inner coffin, or cartonnage, was given a Computerised Tomography (CT) scan at Newcastle General Hospital. It revealed that she has a full set of teeth, including her wisdom teeth. Gill Scott, Egyptologist at the Hancock Museum, said that this meant she was probably aged between 21 and mid to late-30s when she died. This age range is backed by the fact that there appears to be no signs of arthritis or disease in her bones. She was also around 5ft in height." I promised some time ago that I would post a bibliography for the climate during the Late Quaternary and Early to Mid Holocene in the Eastern Sahara. So, in response to a number of people who have asked me to provide references for ancient climate resources, I've assembled a list of references, both online and offline, that might come in handy for anyone hoping to get to grips with the subject. I've posted it on my portal page at the above address, from where it can also be downloaded as a Word file (19 pages of A4). N.B. - this is still something of a work in progress, with one or two of key references lacking either their date or title - these missing bits will be updated shortly. Anyone who has any references to add (or have an inclination to complete some of my gaps), please do email me - additions will be most welcome. Egypt is generally described in the general context of north east Africa, and it is quite clear that climatic and environmental conditions were not straightforwardly homogenous throughout the region. As you will see if you look at the list, the references are not exclusively for the Eastern Sahara - some are for the western zones, and some refer to sub-Saharan regions. Still others refer to global climate change projects. I haven't had time to sort the list into geographical areas, but most of the titles are clear enough. I will update the page with a new date every time I add new references, so that it is clear when new references have been added, or existing gaps completed. "Modern medical advances are being used to unlock the secrets of a middle class Egyptian woman who lived and died 3,000 years ago. The mummified remains of Bakt Hor Nekht, encased in a linen and plaster inner coffin, were bought at a local market and brought to Britain in 1820. Now a full Computerised Tomography (CT) scan at Newcastle General Hospital is yielding a wealth of information. Bakt Hor Nekht was 5ft tall and had a full set of teeth, including wisdom teeth, and no signs of arthritis or bone disease, which suggests she was between 21 and 35 when she died. A substance found on her teeth may have been painted on as a cosmetic exercise after her face was damaged during embalming." Read the above page for the full story. "Who says you cannot explore Egypt from the comfort of your home. Those with a passion for the ancient Egyptian civilization can now indulge their craving by logging on to the richness of antiquity pieces of the Egyptian Museum in Turin, Italy, that truly a rarity, if they click on www.eternalegypt.org, the deputy director of the Cairo-based Centre for Documentation of Cultural and Natural Heritage (CULTNAT) has said. CULTNAT, an affiliate of Bibliotheca Alexandrina, and Egyptian Museum in Turin signed Thursday a cooperation agreement to that effect, Eglal Bahgat said in statements. Under the agreement, Egypt will be posting a collection of antiquities, on display at the Egyptian Museum in Turin, Eternal Egypt website, Bahgat said. Several antiquities of tomb No.8, which was discovered in Luxor back in 1906, will be shown, the CULTNAT official added. The tomb was found intact with all its funereal contents, Bahgat said. This and so much more is awaiting Egyptomaniacs visiting website, she promised. Eternal Egypt has won several international honor prizes in the past few years, the latest was for its electronic content." THis is the entire time on the SIS website. "The Flint Institute of Arts reopens Sept. 30 with a new 10,000 square-foot wing, an Egyptian exhibit and a massive fresco covering one long wall." The museum is celebrating its reopening with a temporary exhibition September 30th 2006 to Jananuary 7th 2007: Excavating Egypt: Great Discoveries From the Petrie Museum of Egyptian Archaeology, University College London. "Early this week the conflict between businessmen Adel Iskandar, owner of a number of bazaars in Old Cairo, the priests of Old Cairo's churches and the Supreme Council of Antiquities (SCA) reached a deadlock. Bishop Selwanss, general bishop of the Old Cairo, Manial and Fum Al-Khalig churches, has appealed to President Hosni Mubarak asking his direct intervention to prevent any harm to the Coptic churches at the Mugamaa Al-Adian (religious compound) in Old Cairo by a so-called violation of the backyard of St George's (Mar Girguis) Church by a "powerful" Coptic businessman named Adel Iskandar who is planning to build a tourist complex including a bazaar, a restaurant and a pub." News that an Egyptology-based game to be launched shortly in North America: "North Americans will soon get their first look at Ankh, the 3D comic adventure first released throughout Europe earlier this year, as publisher Viva Media announced that the game has shipped to retailers. Although taking place in the familiar setting of ancient Egypt, the game is anything but the usual dry, dusty interpretation of such a fascinating time and culture. Instead, the game is a bright, humourous romp in and around Cairo, filled with bizarre characters and wacky obstacles." Excellent news from Bob Partridge, Editor of Ancient Egypt Magazine: The August/September issue of "Ancient Egypt" magazine is now available as an electronic version. The issue is available as a pdf file and a broadband connection is reccommended to access the file easily. A "sample" set of pages from this issue is also available (where broadband is not so critical). Visit the web site at the above address for details of how to access the electronic version and the cost. All future issues of the magazine will be available this way and it is the intention, over a period of time, to make all the back issues available too as pdf files too. This will, hopefully, be of special interest to those abroad (outside the UK) who may in the past have experienced difficulties in obtaining the magazine or to those who are not happy to pay the high postal charges to overseas addresses. The most recent issue of Minerva (volume 17, number 5) contains an article on the Egyptian galleries at the Cambridge (UK) Fitzwilliam Museum. Minerva only have the full contents listings with authors for issues in the archive, but the cover can be seen at the above page. "A two-thousand year old artifact hits the examination table at Bridgeport's Barnum Museum. An endoscopic camera and x-ray machine will help scientists get a rare look into the past of an Egyptian mummy. Word has it the mummy was once an Egyptian priest whose name was Pa-Ib (pie - eeeb), and now scientists from Quinnipiac University want to know more about this relic." "If the mummy is stable enough to be moved, the archaeological team hopes to take a CT scan at a local doctor's office. That would give them a more detailed photograph than they were able to secure on site Thursday. The first film revealed Pa-Ib's got bad teeth . . . . the research would eventually reveal whether Pa-Ib had a life of labor or leisure, old fractures and the gender, Becker said. Kathy Maher, the museum's executive director, is eager for a translation of the hieroglyphics on Pa-Ib's sarcophagus." I'm back in the land of Web access and have now updated the blog. Hopefully I haven't missed too many significant items. The updates have been completed back until 1st September 2006, and the postings match the release dates of each of the original news items. You will need to use the archive to see the earliest of this month's postings. Thanks very much to Aayko Eyma, Kat Newkirk and Tony Marson for sending me news items - you are absolute stars. "Pushing gently against banks lined with fragrant fields of cotton and sugar cane, the Nile River may be the most famous waterway in the world, conjuring up images of a sultry Cleopatra basking on her seductive barge. Despite such decadent connotations, throughout Egypt’s history, the Nile was and remains the backbone of a nation at work. And, even a tourist observing from the deck of a luxury cruise ship can see this, watching as crops are tended by the fellahin - proud rural farmers, whose children smile and wave at every passing vessel. Dinghies and feluccas - elegant sail boats whose style dates back to ancient times - ferry passengers and goods back and forth." Pharaoh's daughter who was the mother of all Scots? "Walter Bower wrote his compendium of Scottish history, Scotichronicon, in the 1440s. This sweeping Latin text aimed to set down the history of the Scottish people from the earliest times – and by so doing to show what race of people we were. He referenced his chronicle from ancient texts and oral history. What he recorded was astounding. According to Bower, the Scottish people were not an amalgam of Picts, Scots and other European peoples, but were in fact Egyptians, who could trace their ancestry directly back to a pharaoh's daughter and her husband, a Greek king. A replica of an Egyptian mask similar to that found with Tutankhamen. The queen's name was Scota – from where comes the name Scotland. The Greek king was Gaythelos – hence Gaelic, and their son was known as Hiber – which gives us Hibernia. . . . . Few historians have taken the story to be anything more than a verbose bit of Middle Ages origin story-spinning, created by a nation who needed to prove that they were of ancient stock. . . . But now a new book, Scota, Egyptian Queen of the Scots, by Ralph Ellis, claims to prove that this origin myth was no made-up story but the actual recording of an Egyptian exodus that did indeed conclude in Scotland." ABC News photo page of some of the KV63 photographs. An Egyptology themed Lego exhibition is opening on the 16th September 2006 in Calgary, Canada: "Fascinated with ancient Egypt and the engineering marvels that this ancient civilization was able to pull off? Now imagine seeing a pyramid, a life-sized sarcophagus, a re-creation of Tutankhamen’s mask, plus much more all made entirely from hundreds of thousands of LEGO® bricks! Come discover the beauty and wonder of this lost world or challenge yourself to build your own version of Egypt. But don’t forget to take your picture as the face of an intricate Egyptian sarcophagus!" "An Egyptologist who investigated two hills in central Bosnia believed by some to be ancient pyramids on Wednesday recommended that archaeological digs be carried out there. After investigating the two hills for a week, Mohammed Ibrahim Ali, a professor of Egyptology in Cairo, said nobody should be jumping to conclusions — but having in mind everything he had seen in Visoko, his recommendations would be that 'it is worth digging here.' "
"When the web began, web space was very expensive and people reduced their resolution to store poor resolution photos ... grainy ... poor detail and color. Now we can get gigabytes of free web space for our photographs. Now we have high resolution digital cameras. The idea is to bring all their members together in a search of high resolution pictures of ancient Egyptians. The pictures to be stored in a public domain photo album. Say some one contributes or finds an image of the burst of Tut that is 45kb. Later another guy finds an image of the same burst that is 200kb. The higher resolution of the image replaces the old one. As the images are added to the public domain album, the group owners or any of their members can link to the high resolution photos of high quality. This is not another discussion group. Any one who joins should use the no mail option and the only thing they would post to the group is pictures or links to good quality pictures." See the above pages for full details. The project has only just been launched and it is as yet unclear how it will be organized. The Valley of the Kings (Wadi Biban el Mouluk) on the West Bank of the Nile in Luxor, in the Arab Republic of Egypt, is a World Heritage site whose archaeological fame and economic importance as a tourist destination are internationally recognized. The result of its popularity has been a massive increase in visitor numbers over the last decade, now often exceeding 7,000 visitors every day. This number is guaranteed to increase in future years. Without carefully prepared site management plans, the very existence of this fragile resource could be seriously threatened.In the spring of 2004, the Supreme Council of Antiquities (SCA) commissioned the Theban Mapping Project to prepare a site management masterplan for the Valley. This project was generously supported by the World Monuments Fund (WMF), and the American Research Center in Egypt (ARCE), and several private donors. This ‘final draft for public consulation’ is now available for you to download and we would very much like to have your feedback regarding our proposal for the future of this very important site." A Times summary of the "KV64" story to date: "Dr Reeves believes that the site, neighbouring tombs KV62, that of Tutankhamun, and KV63, the most recent discovery, is likely to represent another burial of the period after the reign of the 'heretic' pharaoh Akhenaten. It may even be of those who once lived in his abandoned capital of Akhetaten at Tell el-Amarna. The find was made during the survey that located KV63, which this year yielded coffins empty of mummies, but containing embalmers’ gear. The latest issue of the Egyptological journal KMT illustrates many of the the KV63 finds, including the naturalistic faces painted on the coffins and the feather-stuffed “pillows” found crammed into one of them." "Experts examining new images of one of the Hancock Museum’s oldest residents, the mummy Bakt Hor Nekht, have started to reveal some of their findings. The 3000 year old mummy, dating from 1070–712 BC, was examined during a recent Computerised Tomography (CT) scan at Newcastle General Hospital on Thursday August 31. X-rays were beamed through the mummy at regular intervals while moving 360 degrees to create a remarkably precise three-dimensional image. This non-invasive technique has allowed experts to zoom in on areas of interest and break down the images for analysis. The spectacular results promise to yield new information that could reveal who she was, how old she was when she died and provide insights into the mummification process revealing the objects she was mummified with." See the above page for scanned images and the full story. "Naguib Mahfouz wrote about his Cairo not as an abstraction but as one long street of shopkeepers, government employees, pensioners, quiet decent people and the other kind, the small-time thieves and phonies, the smiling men beckoning to customers in front of the stores and the stoic women in the back. The way Naguib Mahfouz described it, his Madiq Alley wasn't that different from Texas Avenue. It took him 12 years to write his signature Cairo Trilogy, each volume named after one of Cairo's streets: Palace Walk, Palace of Desire and Sugar Street. It was precisely because they were so local that his books had a universal appeal; he would be awarded the Nobel Prize for literature in 1988." "A meeting with Mahfouz Hisham Matar recalls a secret soirée in Cairo with the late Nobel laureate". "Enigmatic and reserved, Mahfouz captured a world now surpassed by change." "No need to jump a jet to London to tour the British Museum's Egyptian art exhibit, which has the largest collection outside of Cairo, Egypt. A large sculpture from Britain's exhibit of ancient Egyptian art. The Oklahoma City Museum of Art is the first stop of a five-city tour of an 85-piece exhibit from The British Museum titled Temples and Tombs: Treasures of Egyptian Art From The British Museum. Hardy George, chief curator for the museum, said the items are representative of the rule of the pharaohs, from around 2686 B.C. to the fourth century A.D. . . . With items constructed of stone, glass, gold, papyrus and terra cotta, the largest is the red granite Lion of Amenhotepp III reinscribed for Tutankhamun that weighs 6,000 pounds and the smallest, a gold, 3/4-inch lion bead. A crew of 12, including three staffers from The British Museum, have been working since Aug. 21 to ensure that the exhibit is ready when it opens Thursday. The Egyptian art treasures will be on view in Oklahoma City until Nov. 26." The exhibition runs from September 7th until November 26th 2006. Before the freshly painted walls could be put in place, several massive statues had to be rigged and set on their pedestals. Moving the bigger pieces took an entire day, a forklift extension, special equipment and 11 people, including a specially trained rigger from Chicago. Protecting the workers and artwork meant carefully coordinating everyone’s movements during rigging and moving the giant objects, Sanchez said. To move the 6,000-pound granite lion, the exhibit’s heaviest object, the team used a double gantry, a kind of A-frame, with four chains dangling from it. The chains were hooked to straps that went under the lion, which was covered for the move, so it could be raised and then lowered onto its pedestal. Each chain used could hold 6,000 pounds on its own. "The output of 45 years of Polish archaeologists’ work in Sudan will be presented during an exhibition - In the sun and desert at the National Museum in Warsaw. Magdalena Rościszewska from the Museum’s Promotions Department informs that artefacts borrowed from the National Museum in Khartoum will also be exhibited. Artefacts, which have not been presented or conserved in the National Museum laboratories will also be shown to the public. Pottery and architectural decorations, epitaphs with Coptic and Greek inscriptions as well as small household utensils will be presented. The exhibition will include photos taken by Polish archaeologists in Sudan, printed on boards." More re rumours that Brendan Fraser and Rachel Weisz will take part in a third Mummy movie: "Believe it or not, Brendan Fraser's Mummy franchise isn't dead. Sure, the spin-off Scorpion King was a bomb, but apparently, The Mummy lives on. TMZ says a third movie is on the way, with shooting to begin next year. According to several sources Fraser has already been signed to reprise his leading role in the film. What's surprising is that apparently Rachel Weisz is clamoring to be involved again". "Jean Revez studies old things, but that doesn't make him wedded to old ways. The professor of Egyptian history at the University of Montreal in Canada is developing one of several emerging techniques for electronically recording and interpreting ancient stone inscriptions. Today most archaeologists record writing and other architectural details using pencils, pens, and paper, 'tools that are really quite ancient,'Revez said. In his vision of the future, epigraphists—archaeologists who study inscriptions—will rely instead on digital cameras, specialized computer software, and their dexterity with a mouse. The new techniques will enable scientists to study ancient writing in unprecedented detail—and possibly preserve monuments that are being steadily eroded by the sands of time." Last week's EEF News Digest is online at the above address, for all the latest information about exhibitions, conferences, lectures and new online and print publications, grants awards and fellowships, new websites, courses and trips, plus a round up of last week's main news items. "Severe climate change was the primary driver in the development of civilisation, according to new research by the University of East Anglia. In a presentation to the BA Festival of Science on September 7, Dr. Nick Brooks will challenge existing views of how and why civilisation arose. He will argue that the earliest civilisations developed largely as a by-product of adaptation to climate change and were the products of hostile environments." "KV63 requires more work. No royal names have been found there, but one of the most interesting seals shows a crocodile and a lion with a captive man standing between them. One of the jars is believed to have contained moringa oil (related to horseradish). Hieratic inscriptions were also found on one of the pottery shards that has been restored by a member of the Egyptian team. We can see now that this tomb was cut at the beginning of the 18th Dynasty and was perhaps robbed at some time during this period. Later in the same dynasty it was used for storing embalming materials. It is clear from the pottery and masks discovered that this storage space bears a close resemblance to the tombs in the Valley of the Kings from the late 18th Dynasty." See the above article for more. "With the approach of a new archaeological season, Jill Kamil takes a look at a number of projects either completed, in progress, or planned for the coming years . . . . Much has been achieved since ARCE signed agreements with USAID, in 1993, 1995 and 2004, to conduct projects for the conservation of Egyptian antiquities. Much remains to be done. Of all the projects in the pipeline, however, perhaps the site management and training programme is among the most important. Upon completion of the plan for Medinet Habu, and following appropriate discussion and approval with the SCA, ARCE intends to implement the site presentation elements of the plan with the team of Luxor participants and with funds from the EAC." 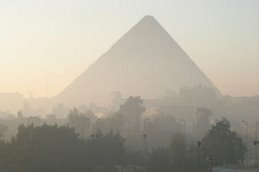 See the above page for the rest of this insight into Egypt's site management priorities. The National Gallery of Scotland is featuring a small exhibtion, until December 10th 2006, which includes a small watercolour by David Roberts in its collection: "Tucked away in the dark recesses of the National Gallery, several small treasures hang, waiting to be discovered. Don't be fooled into thinking that the gloomy atmosphere is a sign that no-one likes them. Quite the opposite. Watercolours are sensitive to light, so it's essential to keep them in controlled light environments. This collection is gathered under the banner of Artist Travellers 1750-1850, and focuses on British painters and their work created abroad during this period. If it had been an appetiser for a larger exhibition, then it might have been a great success. As it is, it falls short as a full show, but it whets the appetite, because it's basically a great idea. . . . David Roberts' sublime Egyptian Temple - thought to be the Temple of Horus and Sobek at Kom Ombo - is small, but captures the eye for a long time, thanks to its delicacy and intimacy." "Discovered in 1912 at Tel-El-Amarna in what used to be the workshop of the sculptor Thutmose, the bust – depicting a woman with a long neck, elegantly arched brows, high cheekbones, a slender nose and an enigmatic smile played about red lips, has become the international symbol of beauty. However, a new examination of the famous bust has revealed visible wrinkles running down her slender neck, and puffy bags circling, leading experts to now believe that Nefertiti was an aging beauty. Dietrich Wildung, director of Berlin's Egyptian museum, who is part of the investigation, revealed that signs of aging had been discovered when he considered using a different kind of lighting to display the bust at Berlin’s Altes Museum." See the full story on the above page. "Egyptian tourism is expected to grow further this year despite current situations in the Middle East. 'Arrivals as of July 2006 already reached 5.14 million. By the end of August 2006, we anticipate 6 million tourists - a 5 percent increase compared to the same period last year,' said Egyptian Tourism Minister Zoheir Garannah, at the 7th edition of the Mediterranean Travel Fair, running September 5 to 7. He stressed solidarity among destinations is key for surviving the recent crisis in the region. Egyptian hotel rooms inventory has reached a new record high of 175,000 with 120,000 more under construction. Minister Garannah took pride in the rate the hospitality industry is expanding facilities." "Egypt's Sunken Treasures, a spectacular exhibition of ancient Egyptian artefacts, set a visitor record for the Berlin venue where it guested for four months, organizers said Tuesday. The show of 500 finds by French marine archaeologist Franck Goddio ended Monday and will next be on display at the Grand Palais in Paris from December 9 till next March. The tally of 450,000 visitors was the best ever at the Gropius Building, a former German museum used for temporary exhibitions." A reveiw of Lost Cities of the Ancients, a TV programme on UK's BBC2: "The main mistake Pharaoh Ramesses the Great made was erecting his capital complete with hundreds of statues to himself in the Nile delta. The course of the river in any delta keeps changing, and today's prosperous capital becomes tomorrow's ghost town. The documentary evidence all pointed to this capital, Piramesse, being built on the westernmost branch of the Nile, but Montaigne, an Egyptologist working in the 1920s, found the architectural remains of the city well east of that point. The mystery of Piramesse being found in the wrong place was restated so often in Lost Cities Of The Ancients that I felt like I was attending a lecture on architecture for thickos." "Tswii, an aquatic plant found in the Thamalakane and Okavango Rivers, is a very popular relish for residents in the north west area. The roots of Tswii, which are tuber like potato are cooked and mixed with pounded meat (seswaa) which gives the relish that yummy taste. But the plant is not only good for eating, it has played a crucial part in some ancient cultures and also has some medicinal properties. The blue water lily also called the Egyptian lotus, blue lotus or Sacred Lily of the Nile, featured prominently in the art of mythologies of the Chinese, Minoan, Indians and Moyan cultures." "Founded by Morkos Smeika Pasha, the Coptic Museum opened in 1910 to trace and preserve the history of Christian Egypt by displaying artifacts recovered from Egypt’s monasteries. After nearly two and a half years of restoration work, the Supreme Council of Antiquities, in partnership with USAID and the American Research Center in Egypt, reopened this 8,000-square-meter complex, housing a collection of approximately 14,000 pieces, some dating back to the third century AD. The building is an architectural marvel combining Roman and Mediterranean styles, with white stone walls accented by smooth pillars and wood-latticed windows overlooking a terrace blooming with flowers and palm trees. Inside, you find heavenly high ceilings of ornately carved dark wood, providing a canopy over marble floors twinkling with mashrabeyya-filtered sunbeams. The two-story museum is well organized, with exhibits arranged chronologically throughout 14 halls embracing an inner courtyard." "The Ancient Egyptians believed that alabaster was associated with the sun gods. For this reason, it was chosen to cover the walls of temples and tombs; even sarcophagi were built from the harder veins. The religious significance has been passed down through the ages. Early Christian churches were decorated with alabaster, and, to this day you can find many of the altars in Egyptian churches made from the stone. The tradition carried on with the arrival of Islam: The most famous example of this is Mohammed Ali’s Alabaster Mosque at the Citadel, so called because the mosque’s exterior is sheathed in the stone." See the above page for details of the upcoming plans, including the mummy-cataloging project (including the possibility of DNA testing), the future display of mummies in the Fustat museum, plans to excavate a shaft in the tomb of Seti I in the Valley of the Kings, and a plan to secure a loan of the Nefertiti bust from Berlin. "In February 1996, a UNESCO-organized conference projected that many of Egypt’s archaeological sites will have completely deteriorated within 200 years. Dr. Zahi Hawass, head of the Supreme Council of Antiquities (SCA), disagrees: 'I believe that the situation in Egypt is even more critical.' With the host of problems threatening the remnants of Pharaonic civilization, he estimates that much of Egypt’s cultural history could be gone in half that time. Easily the most publicized of his efforts to preserve Egypt’s past was last month’s move of the 11-meter-tall statue of Ramses II from Downtown to the site of the new Grand Egyptian Museum being built near the Pyramids. Hawass wishes people had protested when the statue was first placed Downtown, but can understand why many didn’t. “If you look at a picture of the square at that time, it was beautiful: clean, not much traffic. Now, it’s filthy and crowded, you have bridges above it, busy train stations, popular mosques and worst — the Metro underneath it."